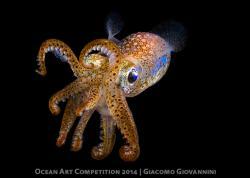 My winning photo in the ‘Compact wide-angle’ category of the 2011 Ocean Art competition was shot in cenote ‘Dos Ojos’ in Mexico. During a holiday in Mexico I based myself in the coastal town Tulum, which is a good gateway to explore the cenotes. Prior to my holiday I had almost one thousand dives logged from years of ocean diving, but I had no experience in cenote or cave diving and only little idea of what awaited me in the underworld of the cenotes. Mexico offers some fascinating ‘Cenote Diving’ in the underground river system of the Yucatán Peninsula. A cenote is a sinkhole, formed by the collapse of the roof structure of an underground river system. The cenote makes an entrance into cathedral-like caverns and a vast network of caves. Cenote ‘Dos Ojos’ is one of the largest and most famous cenotes because of its easy accessibility and fascinating rock formations. It is a fresh water system with water so clear that it seems like air. The diving in Dos Ojos is done in shallow water no deeper than 10m with a water temperature around 24ᵒC, giving you plenty of bottom time to enjoy the beautiful cave system. 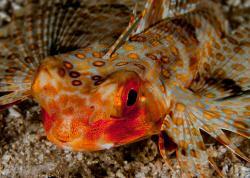 I have always shot with compact cameras underwater as the price and weight of a DSLR-system still is set-back for me. Some months before I went to Mexico I invested in a Canon PowerShot S95 camera, Canon’s own housing, INON wide-angle lens and dual INON D2000 strobes (read about the newer S110 camera). This set-up allowed me to shoot in manual mode, which opened up lots of opportunities (and challenges) in capturing a better photo. 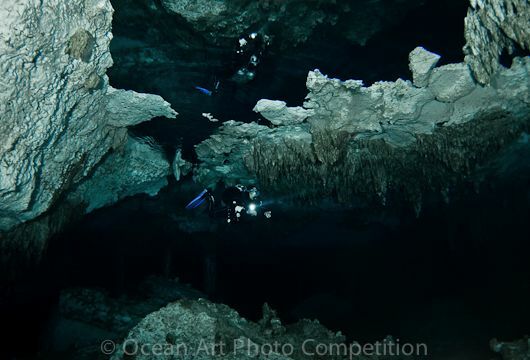 I was fortunate to have a private dive-guide, which gave me the freedom to capture some beautiful photos of the cenote. I informed my guide that I was planning to use him as an underwater model. I have always enjoyed taking photos with a diver in the shot as it often creates a unique mood. 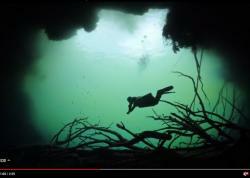 Diving in the cenotes turned out to be a perfect playground for an underwater photographer. There is a great variety of different cenotes, each with its unique and mysterious scenery. It gave me lots of opportunities to play around with different exposure and strobe settings and the dual strobe system was very useful, since a strong and wide flash was needed to light up the cave sceneries.